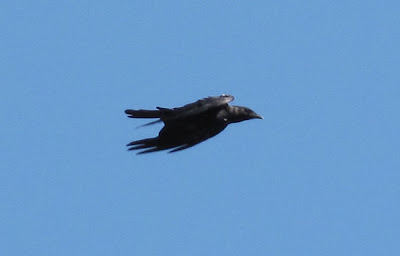 In general, I don't usually get too excited by crows but this evening, whilst cycling on the Turner's Falls bike path with Matan, I heard in the unmistakable calls of a Fish Crow. It was vocalizing from the utility poles along the bike path and the derelict buildings south of the 11th Street bridge. This might not sound too thrilling for birders further south in Hampshire County and elsewhere in Massachusetts but this was the first Fish Crow that I've personally heard and seen at Turner's Falls despite many regular visits since 2005. 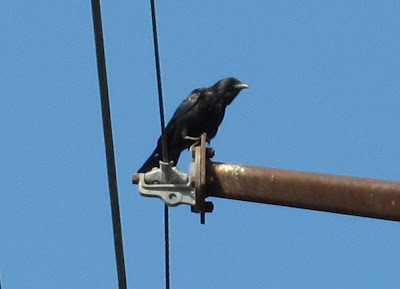 Other than that, the only other 'local' observation that I have was a calling bird on Federal Street in Greenfield in early April 2011. 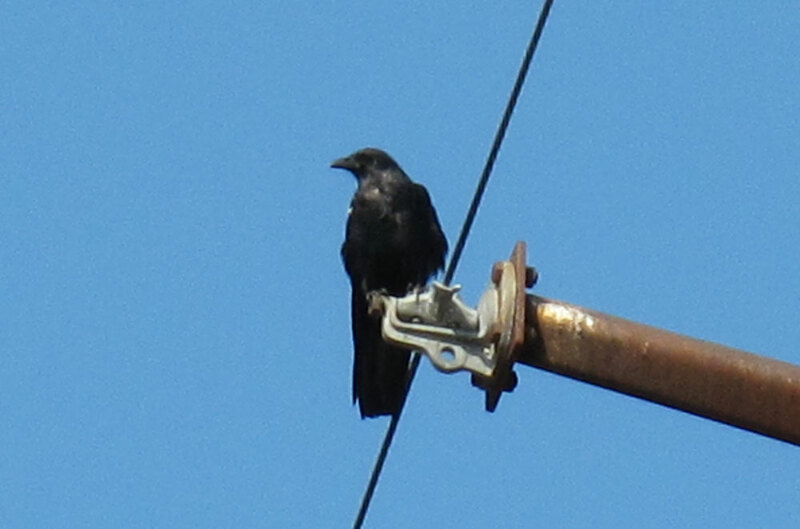 Fish Crow - Turner's Falls power canal, Franklin Co., MA. August 30th, 2013. Giving diagnostic nasal calls, otherwise we would have rode straight underneath it! 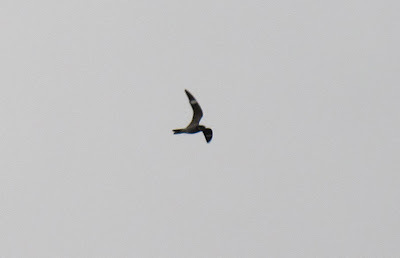 Moreover, once we got back to the vehicle on Depot Street, a small flight of high flying Common Nighthawks was taking place followed by a calling fly-over Semi-palmated Plover - not too shabby for an evening bike ride! Great Blue Heron - Turner's Falls power canal, Franklin Co., MA. August 30th, 2013. Gill - There was still a Yellow-throated Vireo singing this morning (08/30) in a spot where I've periodically heard one singing throughout the summer. Before this morning, I last heard it on August 25th and was impressed to hear him singing again on the rather late date of August 30th. Blue-headed and Red-eyed Vireos can also be heard singing in the same spot centered around the intersection Main and South Cross Roads in Gill. 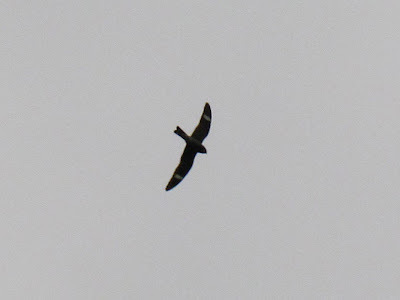 This week also saw several 'waves' of Common Nighthawks moving through our area including about 50 hawking low over Montague on August 26th, and about 30 over Gill Riverside on August 28th. 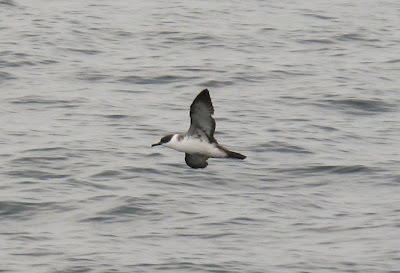 Although Matan and I didn't witness the hundreds being reported from various migration watch points in Western Mass, we had our birds close enough and low enough to provide a real spectacle. Common Nighthawks - foraging over Montague, Franklin Co., August 26th, 2013. Veery - Gill yard, Franklin Co., MA. August 28th, 2013. 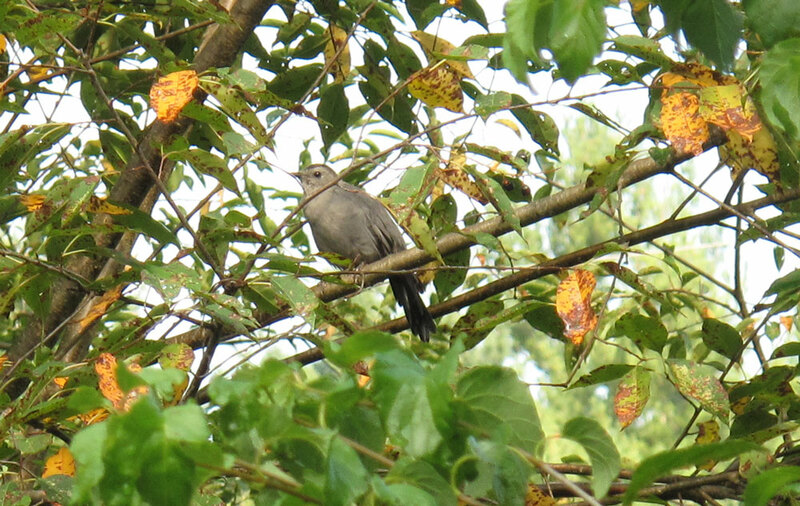 Gray Catbird - Gill yard, Franklin Co., MA. August 28th, 2013. About a dozen present in the yard at the moment. 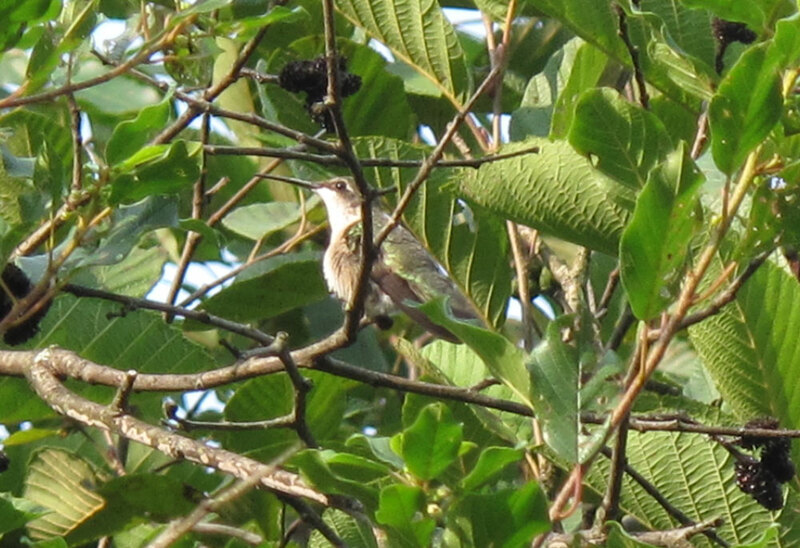 Ruby-throated Hummingbird - female/imm, Gill yard, Franklin Co., MA. August 28th, 2013. 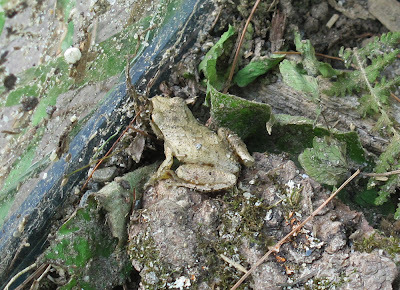 Probably about six present in the yard at the moment feeding as much on Jewelweed as they are on our feeders. We haven't seen our breeding Louisiana Waterthrushes for a few weeks but a migrant Northern Waterthrush has spent at least four days on the stream amongst the Alders. 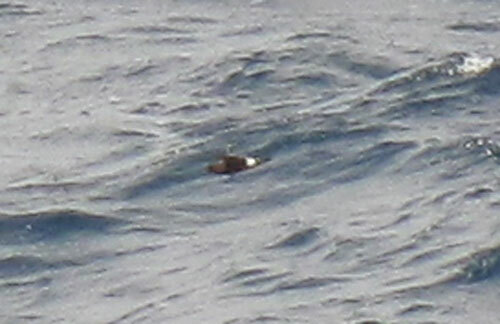 It's been elusive and difficult to photograph. Also saw my first Merlin of the fall this week at the sod fields on Pine Meadow Road in Northfield. 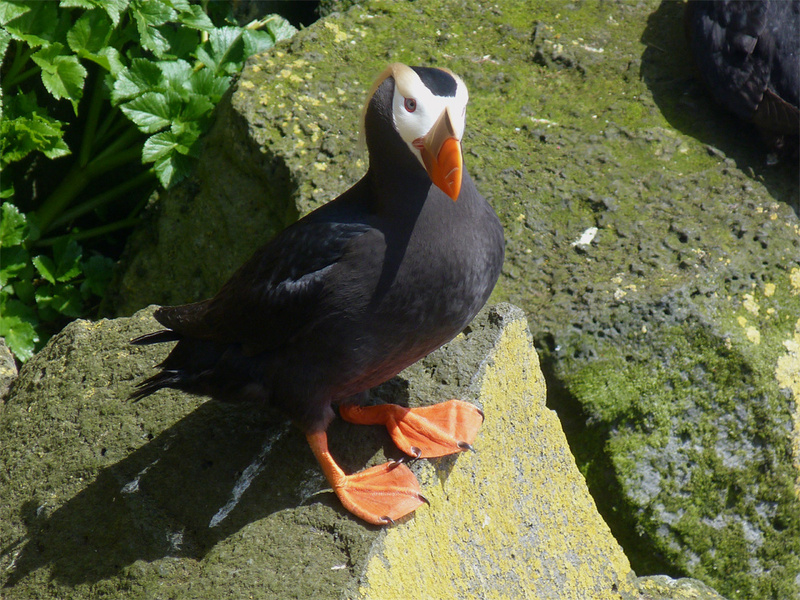 This bird cropped up during a very unproductive search for shorebirds - I couldn't even dig up a Killdeer! 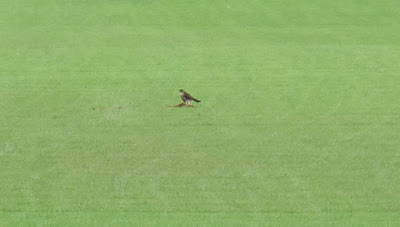 Merlin - juvenile, Four Star Farms. Northfield, Franklin Co., MA. August 29th, 2013. A change in weather would be welcome, hopefully bringing some warbler flocks through the yard. Opportunities for birding have been precious few to non-existent lately, a little frustrating perhaps when signs of fall migration are pretty evident all around us. 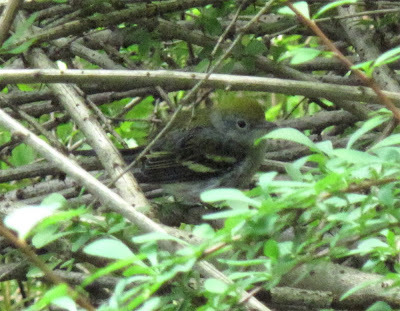 On Wednesday (08/14) a family visit to Energy Park in downtown Greenfield produced our first migrant Wilson's Warbler of the fall. And this afternoon, just with a ten minute spell, I noticed several passerines coming to a secluded spot by the stream that passes through the yard - 2 American Redstarts, a Veery and a very young Chestnut-sided Warbler were amongst the species coming down to drink. 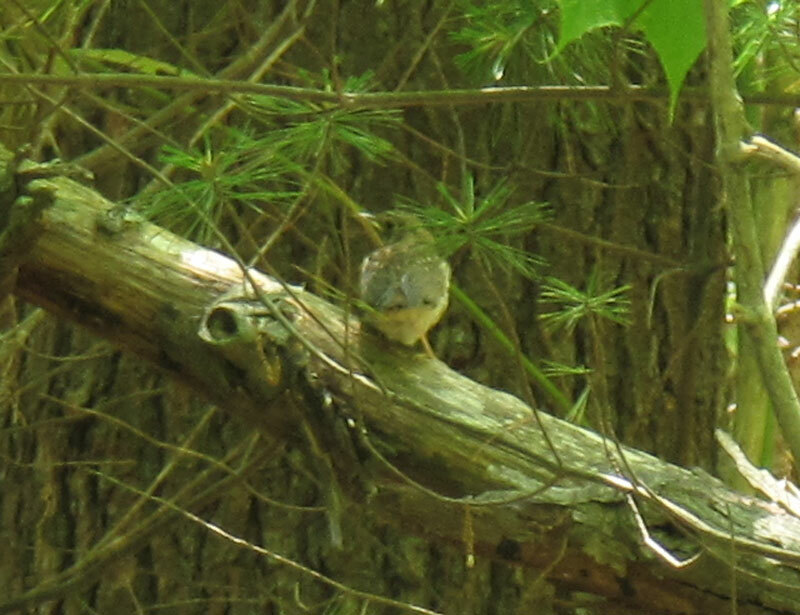 Earlier in the day, a juvenile Yellow-bellied Sapsucker appeared on the utility poles by the edge of the yard as well. Chestnut-sided Warbler - juvenile, Gill yard. 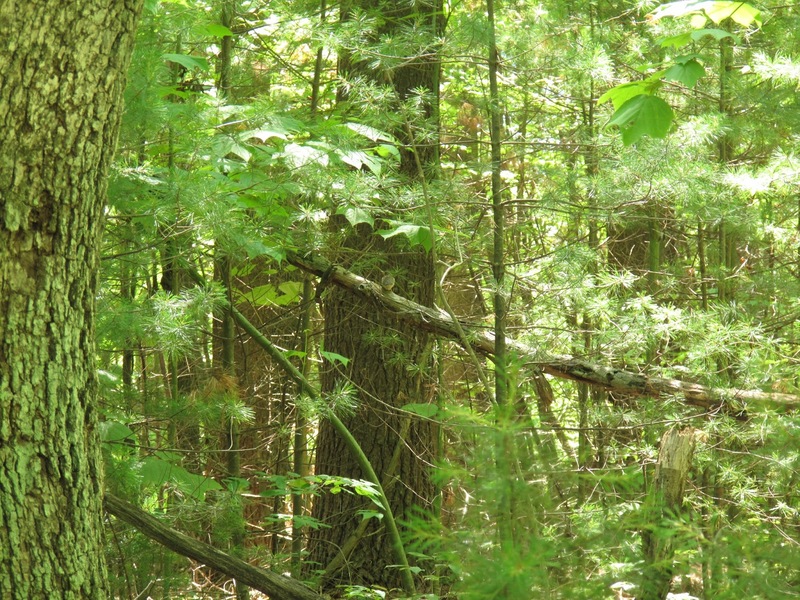 Franklin Co., MA. August 16th, 2013. 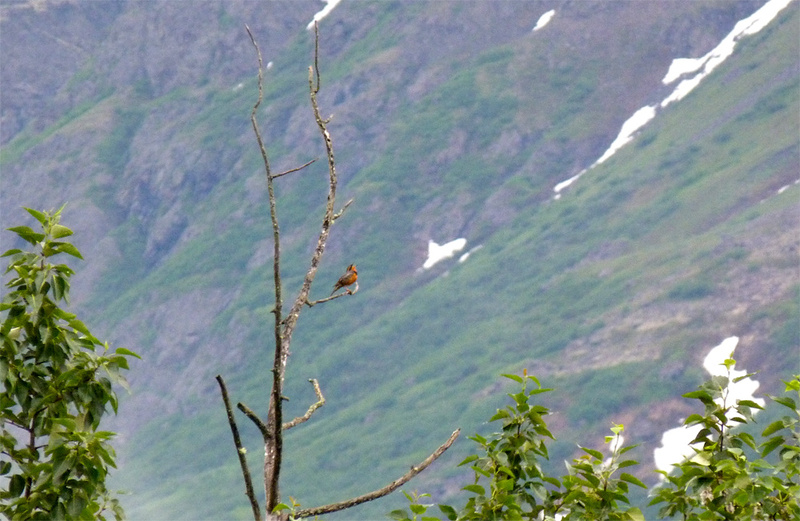 Varied Thrush - singing male, Arctic Valley, near Anchorage, June 20th, 2012. 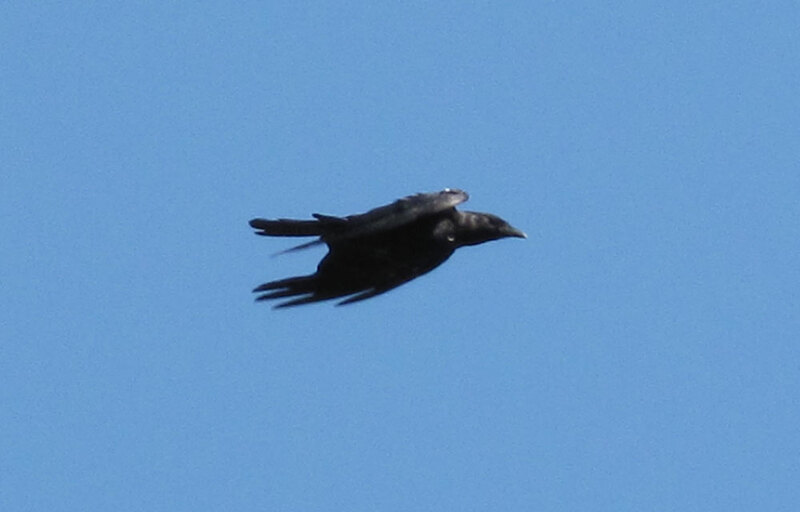 The last few days have seen a few birds of interest around the Gill/Greenfield area. 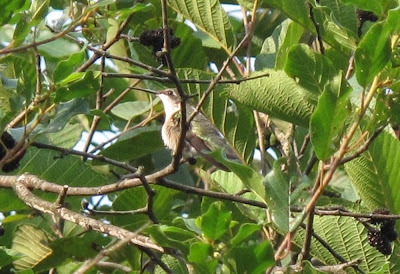 Friday evening (08/09), after a day of solid rain, brought a nice incursion of hummingbirds to the yard. At least eight Ruby-throated could be seen at the feeders and the flowers in the yard, but there was also a one time, rather brief visit from a female/immature selasphorus (Rufous/Allen's). Although we waited for a while afterwards with the camera, the bird never re-appeared for portraits but it was certainly the first time that we've seen anything other than Ruby-throated Hummingbirds at our feeders. 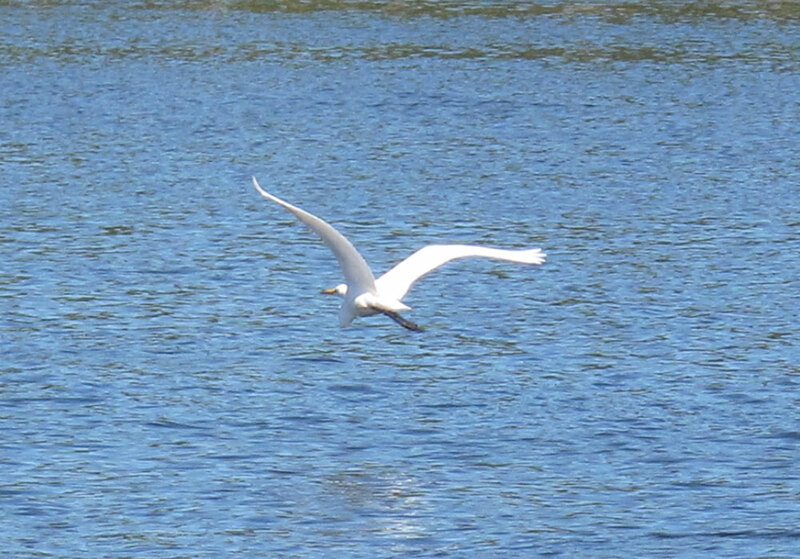 On Saturday (08/10) there was a Great Egret on the Turner's Falls power canal, which despite being flushed frequently by passers-by, seemed content working both sides of the canal. 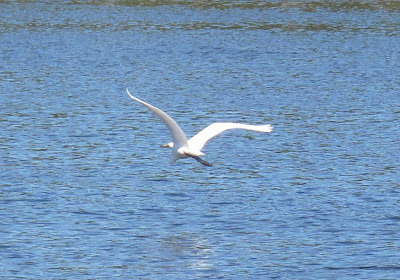 This, perhaps, is only the third or fourth Great Egret that I've seen in the greater Barton Cove/Turner's Falls area. Great Egret - Turner's Falls, Franklin Co., MA. August 9th, 2013. Sunday morning (08/11) on Green River Road (Greenfield/Leyden) still had a few Louisiana Waterthrushes, mostly calling birds, but one was heard singing around sun rise. Three or so singing Winter Wrens present too, as well as numerous calling Veeries and Wood Thrushes. 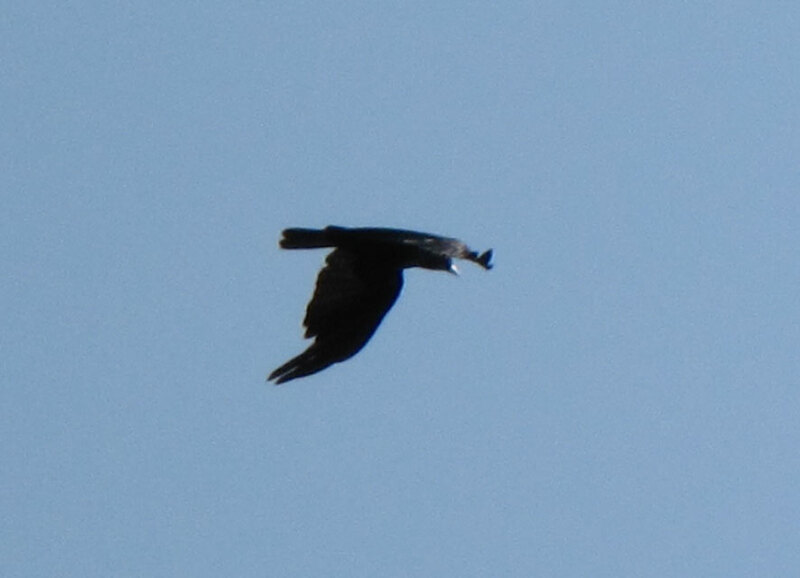 Over our yard in Gill, a calling Broad-winged Hawk heard and seen in mid-morning. 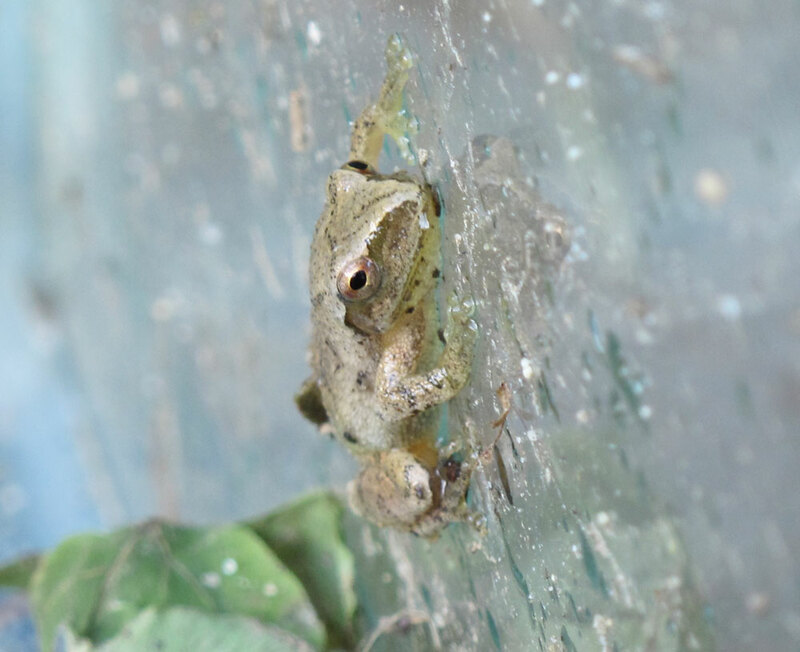 In the afternoon, Matan's sharp eyes and senses found a Spring Peeper in the playground at Giving Tree School on Wood Ave, Gill. Spring Peeper - Wood Ave, Gill, Franklin Co., MA. August 11th, MA. 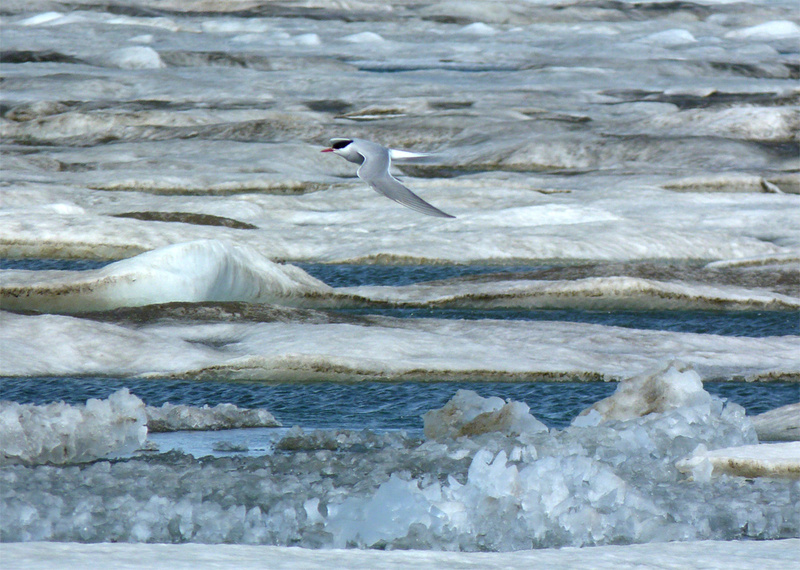 Arctic Tern - over the sea ice near Point Barrow, Alaska. June 21st, 2012. More looking back from the Birdfinders Alaska tour 2012. 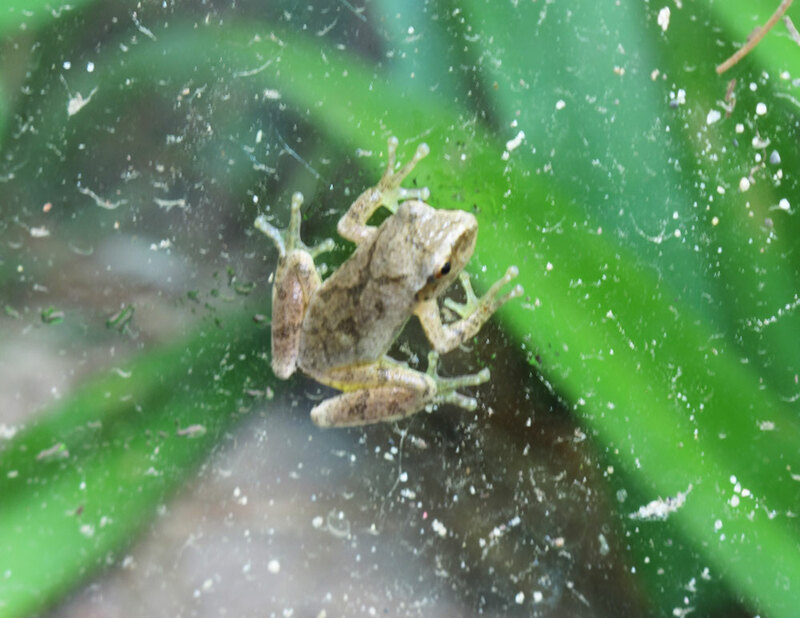 Panasonic Lumix FZ40. and yet another awesome Birdfinders tour of Alaska. Panasonic Lumix FZ40. 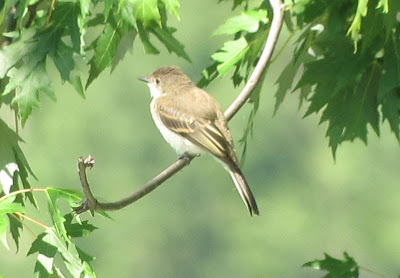 Eastern Phoebe - juvenile, Barton Cove, Gill, Franklin Co., MA. 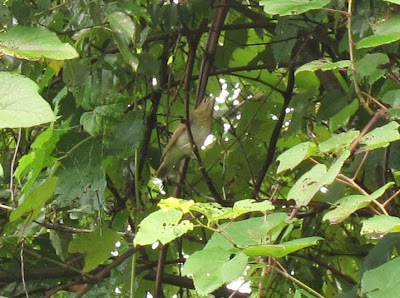 Quite a few responses came from my request for feedback on this odd-looking flycatcher seen and photographed at Barton Cove a couple of days ago. 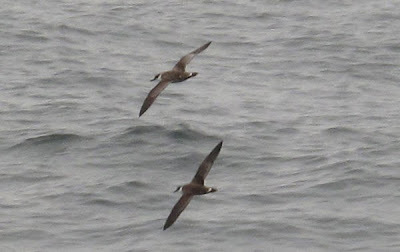 As is often the case, it turned out to be something perfectly common and appropriate to the area. 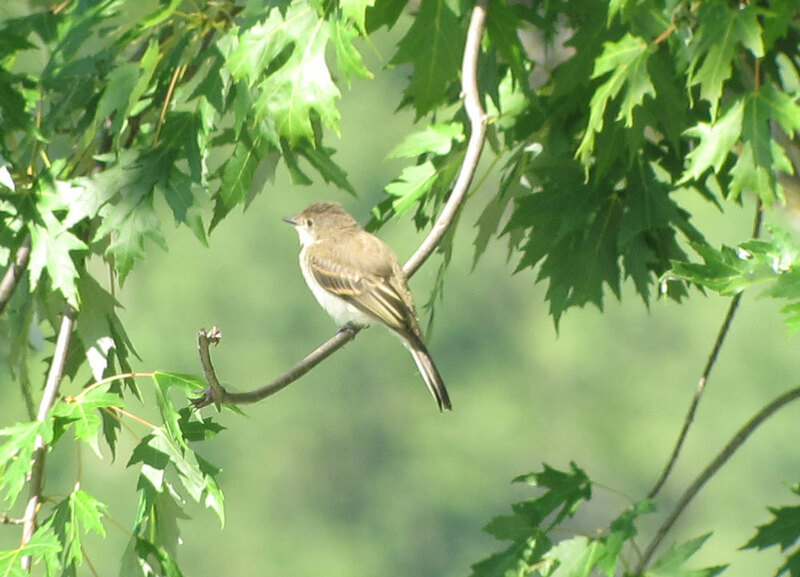 Given the confidence of the respondents, I'm a bit surprised that this bird threw me as much as it did in the field even after I considered my naked eye views of a flycatcher with a downward flicking tail (immediately suggesting Eastern Phoebe). 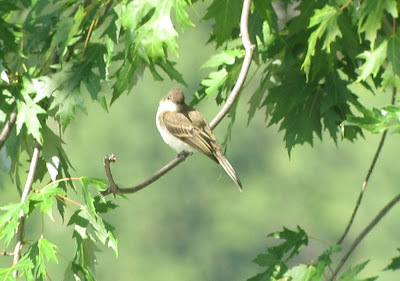 Juvenile Eastern Wood-Pewee was also suggested but Sibley states clearly (In the Sibley Guide to Birds) "Wood-Pewees do not flick their tails when perched" effectively ruling out that possibility. All the likely candidates from the empidonax group could be ruled out by the entirely dark bill (most empids have a pale lower mandible) and the lack of a prominent eye-ring. 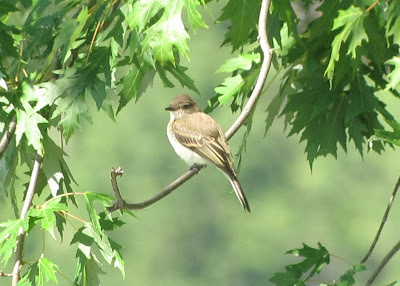 But even so, compared to illustrations in the popular field guides, this bird looked especially washed out seemingly lacking the yellowish lower belly, the dark smudges across the breast and the dark 'cap' and upperside to the tail of juvenile Eastern Phoebe. Each of the respondents commented that young Eastern Phoebes often look like this just after fledging which reminded me of the sometimes underrated difficulties of identifying recently fledged passerines. 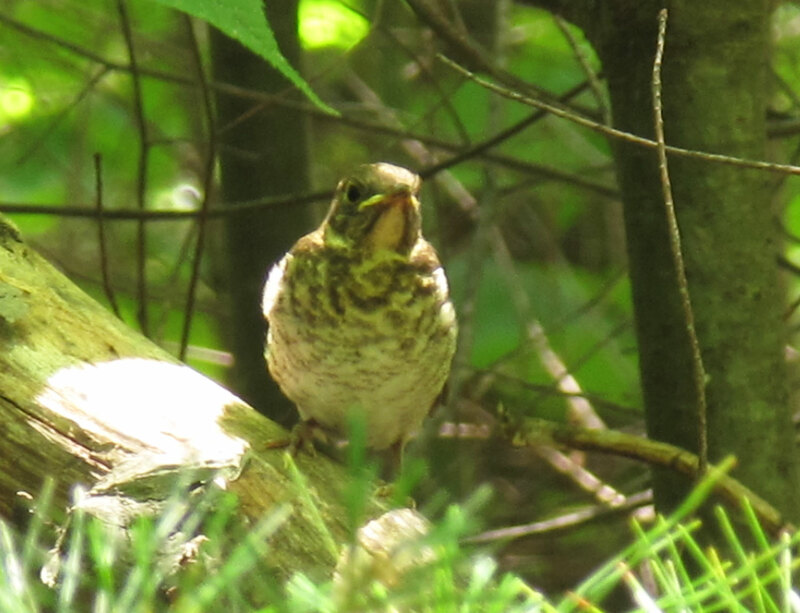 A) unidentified fledgling - Quabbin, Franklin Co., MA. 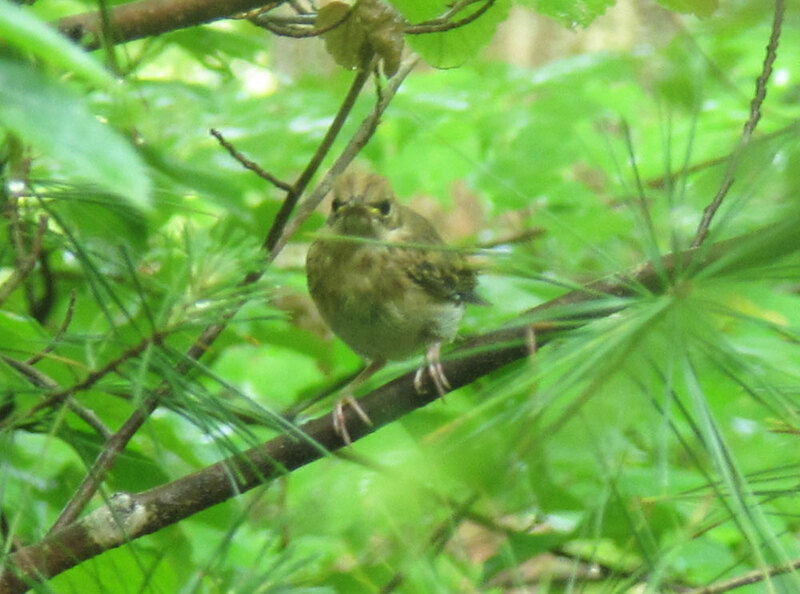 B) unidentified fledgling - Quabbin, Franklin Co., MA. 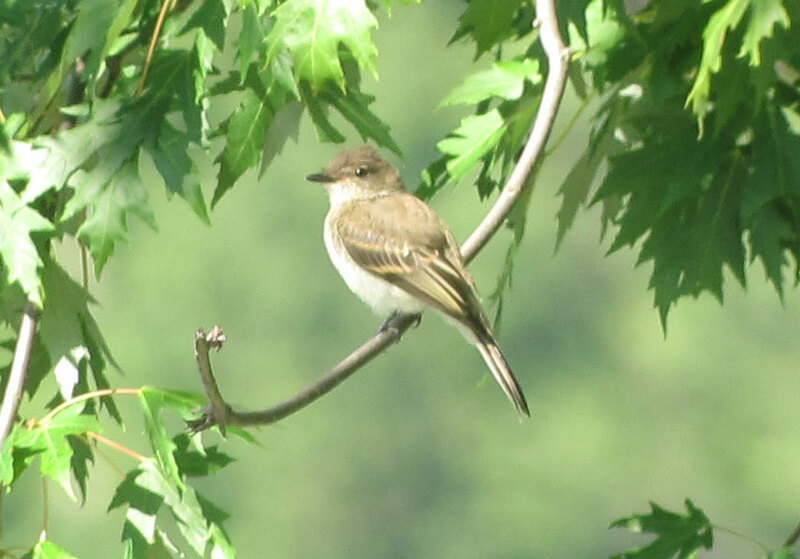 Thanks very much to everyone who responded with comments on the identification of this juvenile Eastern Phoebe. Just another flock of swallows - a classic post-breeding sight along the rural roads of Gill in August . It's so easy to gloss over them but a cursory glance reveals much more than the expected Barn Swallows. 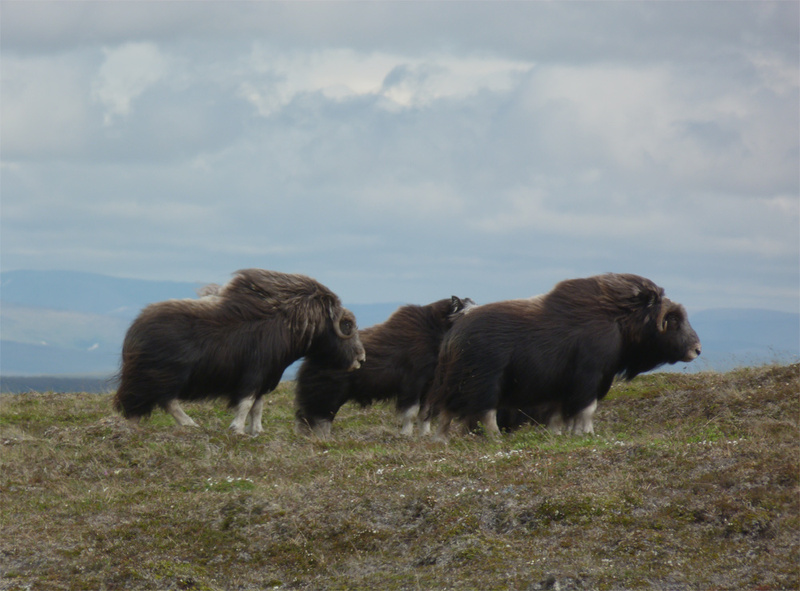 This image contains 17 individuals of three species! North Cross Road, Gill, Franklin Co., MA. August 7th, 2013. Canon Powershot G10. Just another flock of swallows - the same flock a few seconds later. 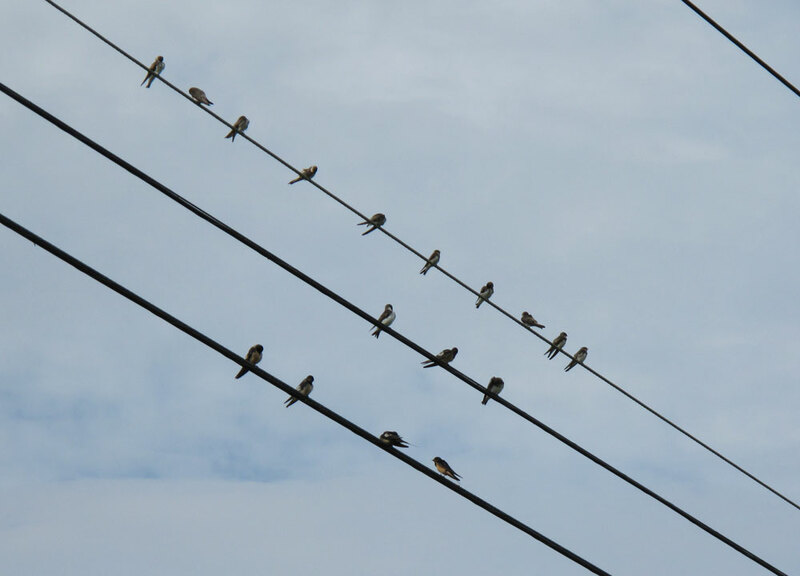 All of the birds on the upper, thinner wire and the birds in flight above and below that wire are Bank Swallows. North Cross Road, Gill, Franklin Co., MA. August 7th, 2013. Canon Powershot G10. 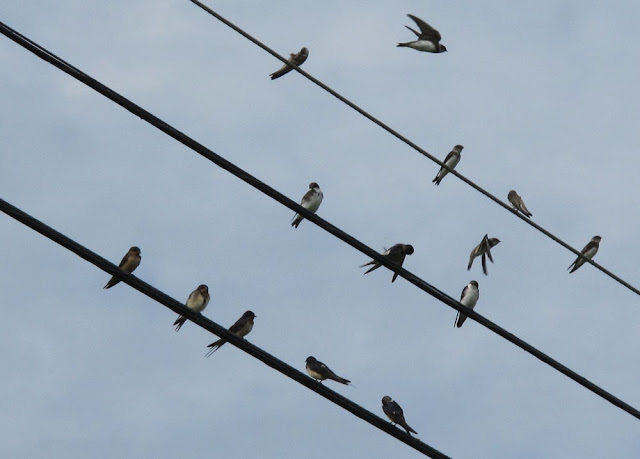 Just another flock of swallows - this heavy crop, again taken a few seconds after the shot above, shows a juvenile Bank Swallow (extreme right), a Tree Swallow (lower middle), a Barn Swallow (upper middle), and three Barn Swallows together (lower left). North Cross Road, Gill, Franklin Co., MA. August 7th, 2013. Canon Powershot G10. 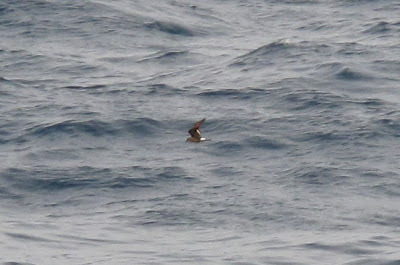 Another highlight from the most recent BBC Extreme Pelagic. The storm-petrel show really got underway in the vicinity of Hydrographer Canyon where activity picked up as we encountered deeper, warmer water. 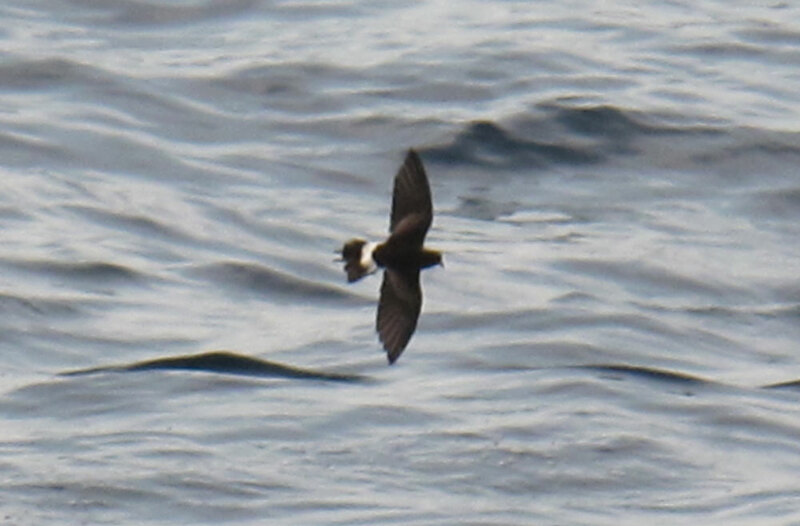 We found most of our Band-rumped Storm-petrels of Hydrographer in what proved to be a great display of this species with just about everybody on board getting reasonably good views of at least one bird. The overall tally for the day was eight Band-rumps and I'm comfortable that I saw about five of these. 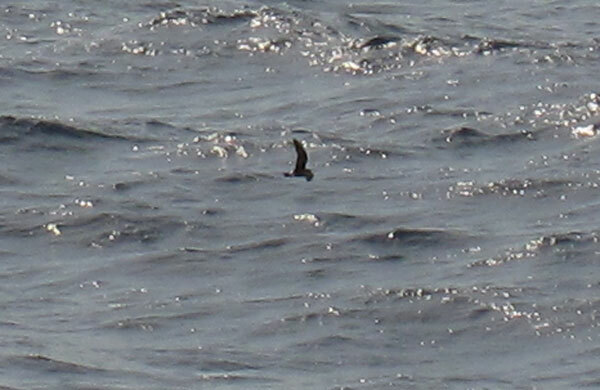 We also had excellent and prolonged views of Leach's Storm-petrels with over 40 birds logged in the final tally. 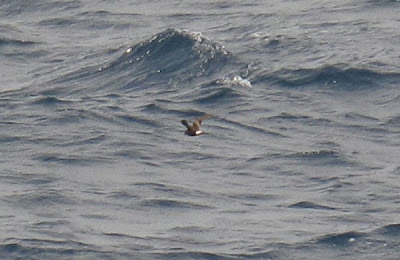 The default species, Wilson's Storm-petrel, was found in some hundreds as usual, though perhaps not as many as we've seen in previous trips. An excellent summary of this pelagic can be found on Nick Bonomo's Shorebirder site. 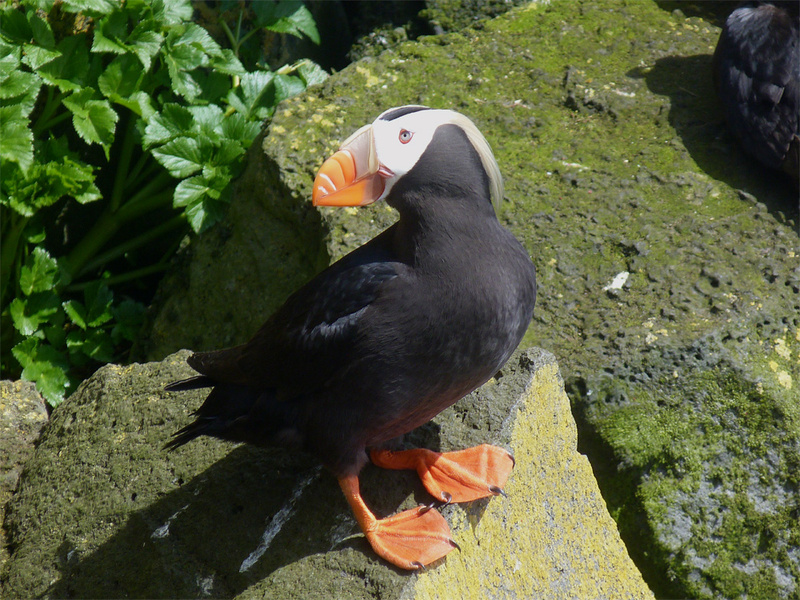 The images below were taken with a point and shoot camera, the Canon Powershot G10. Band-rumped Storm-petrel - south of Hydrographer Canyon, MA. Leach's Storm-petrel - vicinity of Hydrographer Canyon, MA. 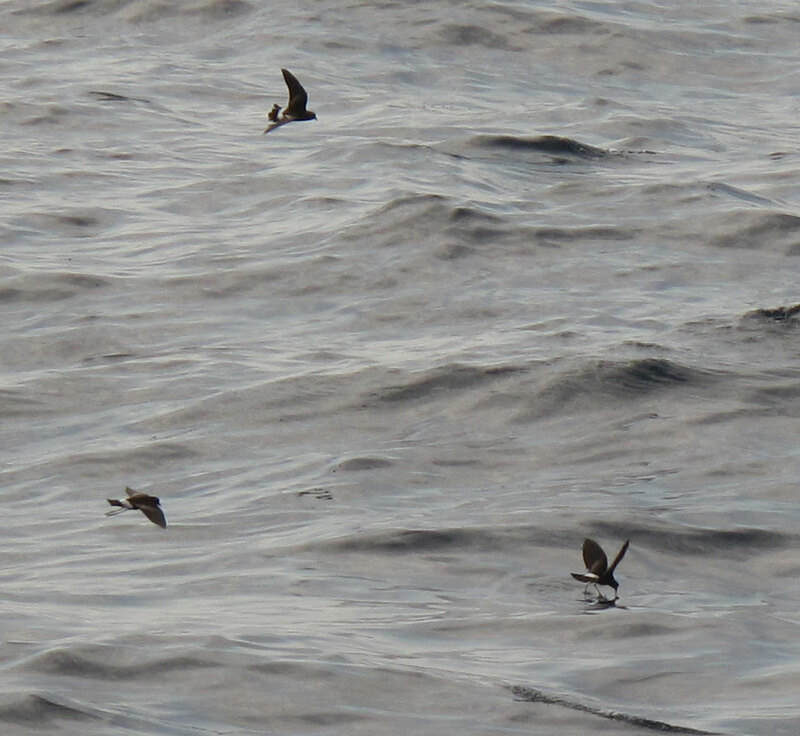 Wilson's Storm-petrel - vicinity of Hydrographer Canyon, MA. 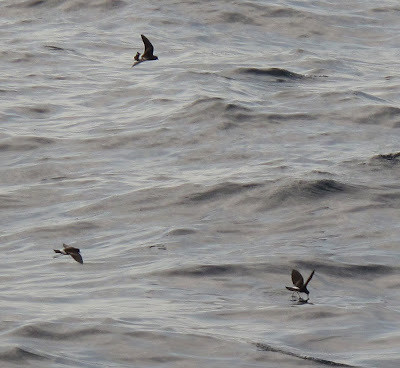 Wilson's Storm-petrels - vicinity of Hydrographer Canyon, MA. 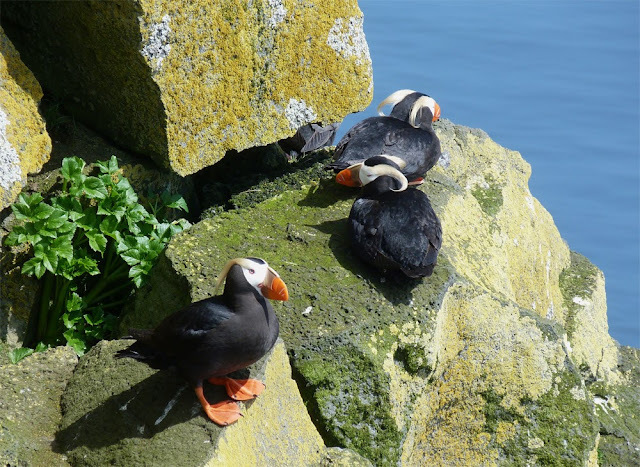 This morning, in between errands, I made a quick stop at Barton Cove in Gill. At the back of my mind was a Swallow-tailed Kite reported from Millers Falls on July 31st, a bird which I only became aware of on August 3rd. Despite lots of optimism and a beautiful fall-like morning for soaring birds, I didn't see any kites soaring whilst I was there. 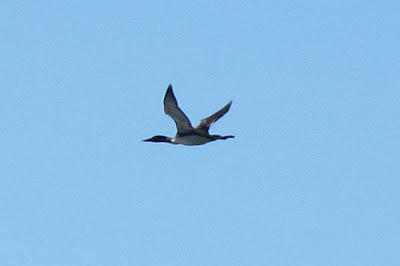 But, as usual, there were birds of interest, most notably a Common Loon in full breeding plumage which briefly surfaced in front of me and then disappeared just as quickly. A few minutes later, the bird was in flight making circuits of the cove gaining height and ultimately heading south. 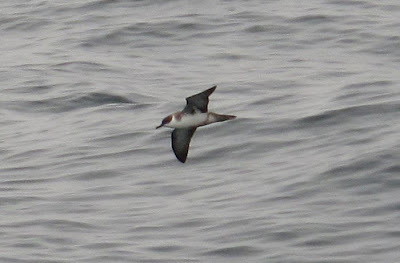 Most certainly a bird on the move and a species which I don't usually see in mid-summer on Barton Cove. 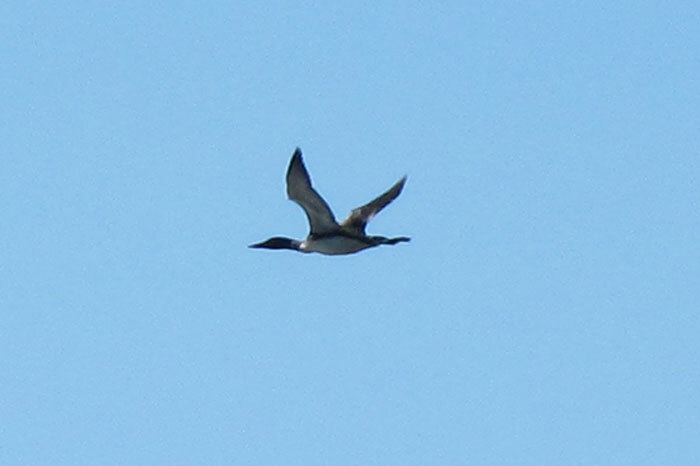 Common Loon - adult in breeding plumage departing from Barton Cove, Franklin Co., MA. A few minutes later, an interesting flycatcher popped up in the large tree right by the boat ramp. The bird had a notable downward flick of the tail, most characteristic of Eastern Phoebe, but on lifting my bins I was surprised to see a flycatcher that more closely resembled a bird from the empidonax group. Unsure of the species I fumbled around trying to get a few digi-scoped images before the bird flicked over the boat ramp and out of sight. My overall sense in the field was that it must be a recently fledged Willow Flycatcher, but I don't recall seeing Willows showing such exaggerated downward tail flicking before. Indeed, Gray Flycatcher is usually the empid most noted for its downward and phoebe-like tail flicking. Moreover, the bird appears to have an odd bill pattern with an almost entirely dark lower mandible which isn't a match for Willow Flycatcher - so what could it be? I'm a little stumped on this one and would welcome some feedback. unidentified flycatcher - Barton Cove boat ramp, Gill, Franklin Co., MA. August 6th, 2013. Canon Powershot G10 and Swarovski HD telescope. 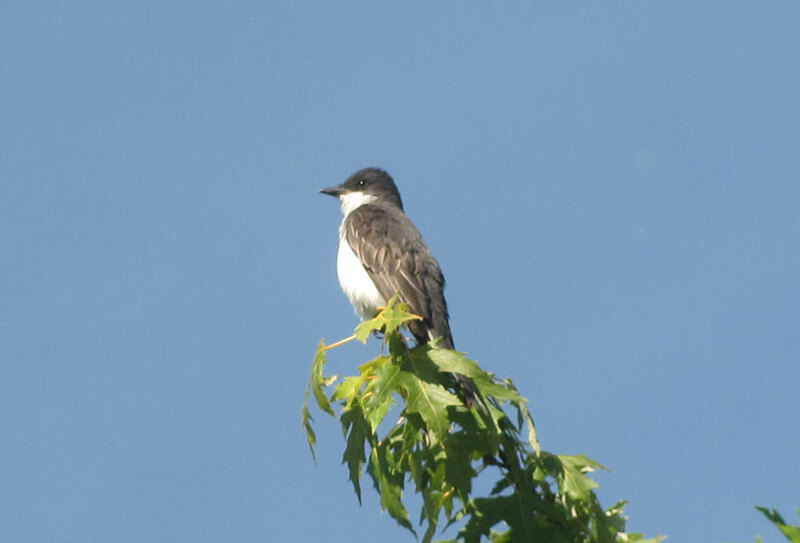 Eastern Kingbirds remain vocal and visible at the boat ramp as they have done all summer. Eastern Kingbird - Barton Cove boat ramp, Gill, Franklin Co., MA. 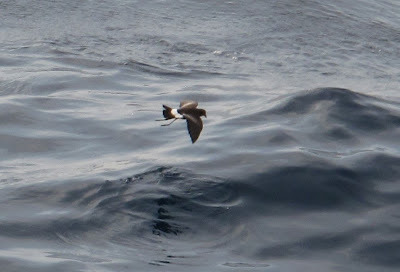 Once again I found myself participating in another mid-summer BBC Extreme Pelagic. The trip was highly successful with good close views of many of our target species including Band-rumped Storm-petrels and Audubon's Shearwaters. 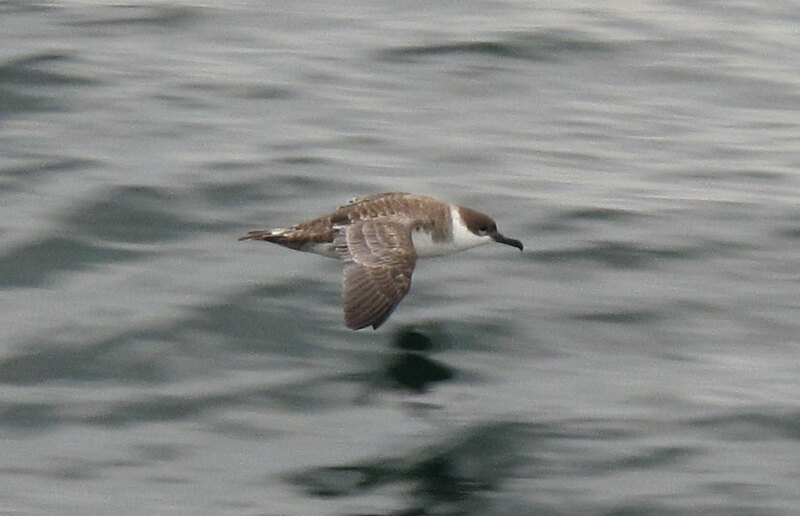 These Great Shearwater images were taken on the return journey as we approached Nantucket Shoals and found several large rafts just resting on the water. 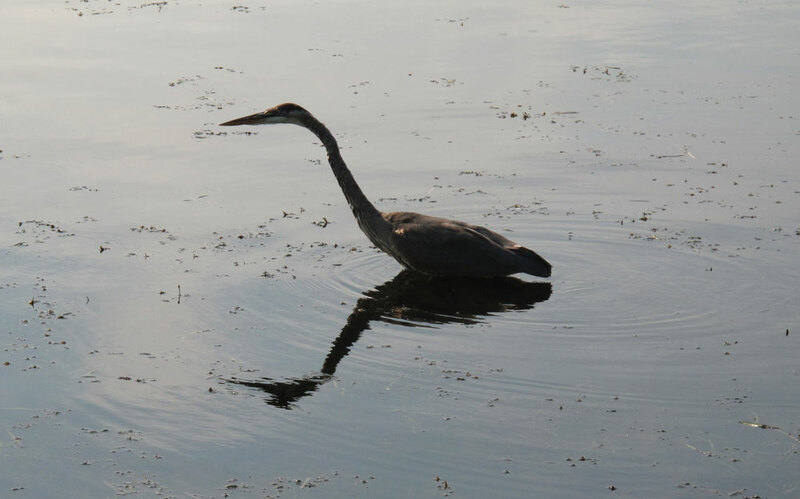 All of the images were taken with a simple point and shoot camera, the Canon Powershot G10 with no other aids used. 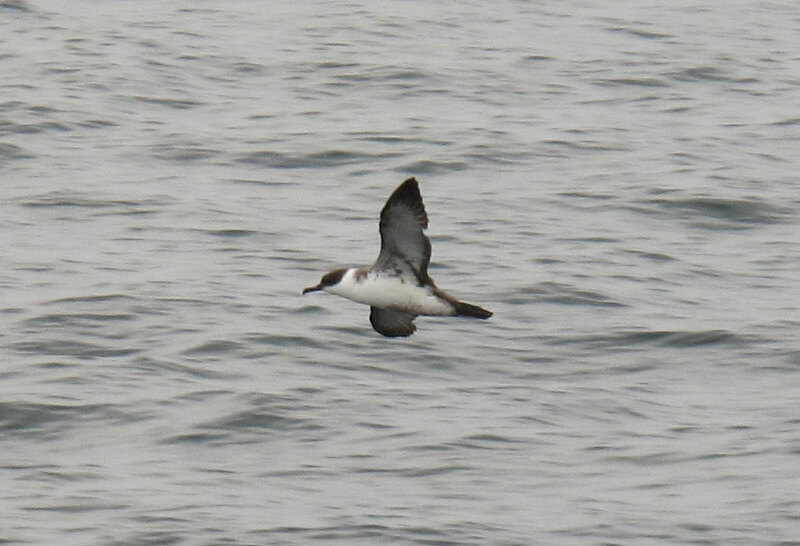 Great Shearwaters - vicinity of Nantucket Shoals, MA. August 3rd, 2013. Sadly no pictures to share, but yesterday, whilst driving Matan home from a birthday party I heard the decidedly 'out-of-place' 'tsip' calls of a Lark Sparrow through the open car window and turned my head to see a long tailed, robust sparrow in strong direct flight over the parking lot of Oak Ridge golf course on West Gill Road. 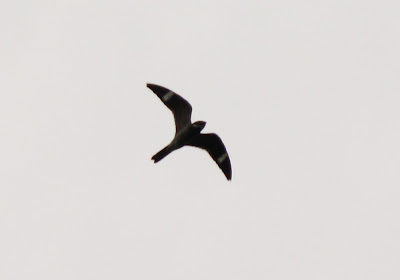 It was flying north, possibly alighting along the tree line directly north of the golf course parking lot. I didn't have any time to stop but may get back to the area to check it out over the next few days. The grassy fringes to the golf course would probably be an ideal place for a Lark Sparrow to feed along with the many (post-breeding) Chipping Sparrows that frequent the same area. On a personal level, this is the first obvious autumn migrant (or post breeding visitor) that I've have seen in Gill this season. I say 'obvious' because Lark Sparrows don't breed in Massachusetts or New England and this bird must have come from parts much farther south-west.